This project merges with the natural surroundings. It creates a retreat where harmony between man and nature can be experienced. Visitors can experience a different sensibility of the man made environment; the treatment of both space and form takes into consideration the human senses of sight, hearing and touch. Entering the building is a beginning of a journey that takes the visitor away from the chaos of the city into the silence of nature. It starts from where the building is placed. There, paths continue at different levels connecting different spaces. From the path that splits the land into two parts, one that represents the city and its chaos and the other representing nature and its silence starts the journey. Taking a boat, the path opens up to the side of nature taking you away from that cost into the heart of silence passing through the mangroves that the birds inhabit. It is an experience that consists of a sequence of events that stimulate the peoples senses and help them be in contact with nature. 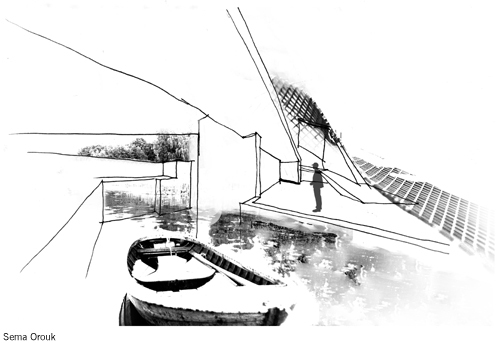 People will be able to sense the combination of water, vegetation and architecture in one place. It gratifies the human desire for a world that is visible and tangible. Architecture constructs a landscape that is inhabited. The landscape becomes both interior and exterior. The form of the building is intended to develop as a device that integrates with the surrounding landscape while at the same time cerebrating its different physical features. 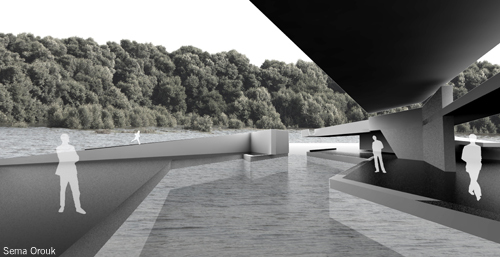 it carves into the land to create different spaces that allow for different activities and experiences.it is mainly a series of concrete walls that orient the visitor through a series of galleries which are exhibitions of work that explains the nature of the site, and views where nature itself becomes the exhibited object for the viewer. The steel skin that wraps around the spaces is both conceptually and physically a connection to the land. It acts as a secondary structure that supports the cantilevered structures. It also acts as a shading device with ventilation abilities in the parts where it has tilted perforated steel cladding. This tilted cladding would allow people to view the site and provide appropriate ventilation through the air movement across the spaces.